Did Iran's Hardliners Orchestrate Start of Iranian Protests? FILE - University students attend an anti-government protest at Iran's Tehran University, Dec. 30, 2017. The photo, obtained by the Associated Press, was taken by an individual not employed by AP. 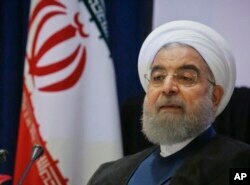 Iranian authorities have accused the West and the country's regional enemies of fomenting the street protests that have roiled Iran for a week, but reformists question whether some of their domestic conservative foes had a hand in orchestrating the demonstrations in the first place — suspecting they did so to weaken the government of President Hassan Rouhani. Media outlets funded by the Revolutionary Guards (IRGC) this week aired interviews with protesters angry about rising food prices and critical of Rouhani's stewardship of the economy, blaming him for price hikes in basic commodities and failing to deliver economic improvements he promised. Some of the social media-based outlets, among them Avant TV, were only launched recently — reminiscent of the sudden rash of pro-regime media sites that emerged during and after the 2009 pro-democracy agitation. The IRGC patronage of Avant TV, which presents itself as an independent internet broadcaster, was first revealed by the news site Al Monitor. Avant TV's coverage has focused on criticism of Rouhani and the seething discontent about economic conditions. It also has been careful to avoid broadcasting anything critical of the country's Supreme Leader, Ayatollah Ali Hosseini Khamenei. FILE - Iran's President Hassan Rouhani listens to a news conference during his visit for the United Nations General Assembly in New York, Sept. 20, 2017. The nationwide protests were first triggered by a rally in Mashhad, hardly a hotbed of liberal anti-regime sentiments. A conservative Shiite holy city, Mashhad is home to two hardliners who ran earlier this year against Rouhani in the presidential elections. One of them is Ali Raisi. His 73-year-old father-in-law reportedly has been instructed to appear before Iran's National Security Council to explain what role he played in the original economic protest in Mashhad last Thursday that triggered unrest across the country. Ayatollah Ahmad Alamolhoda, Raisi's father-in-law, has denied reports of the summons. A member of the powerful Assembly of Experts, he's a firm upholder of clerical rule, and he accused the 2009 pro-democracy agitators of being members of the party of Satan. The hard-liners' exploitation of widespread economic disgruntlement in the wake of price hikes was hinted at in a speech last Friday by Rouhani's First Vice President Eshaq Jahangiri, who told a conference in Tehran: "The ones who trigger political moves in the streets may not be the ones who will put an end to it, since others may ride the wave they have started, and they must know that their action will backfire on them." The country's former hard-line president, Mahmoud Ahmadinejad, has also been mentioned by Rouhani loyalists as having had a hand in the unrest. They argue that the hard-liners were likely surprised by how fast the economic protests spread and hadn't anticipated that a wider set of political grievances would quickly be voiced by the demonstrators. "That the protests originated on 28 December in Mashhad, a bastion of Rouhani's opponents and Supreme Leader Ali Khamenei's hometown, is highly significant," according to Ali Vaez, an analyst with the International Crisis Group, a policy research organization based in New York and Brussels. "Hardliners and conservatives initially welcomed the unrest in the holy city, showcasing the way that elite factionalism has worsened to the point that some of Rouhani's opponents favor instability over siding with his political agenda," he added. 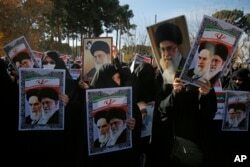 FILE - In this photo provided by Tasnim News Agency, women hold posters showing portraits of late Iranian revolutionary founder Ayatollah Khomeini, and Supreme Leader Ayatollah Ali Khamenei during a pro-government rally in the holy city of Qom, Iran, Jan. 3, 2018. Vaez says Rouhani could seize the opportunity to turn the tables on his hard-line opponents — if he's able to pivot away from being the target of the protesters and "addresses head-on the drivers of the protests and pursue popular reform." And it is reform that worries conservative mullahs and the hard-liners in the IRGC. Some regime opponents argue the timing of the original protest in Mashhad is interesting. It came on the back of publication of the government's budget plans, which highlighted the enormous funds going to conservative cultural and religious institutions. Presenting his budget plans to parliament, Rouhani criticized institutions controlled by hardliners and clerics, and for the first time shed some light on the enormous sums — billions of dollars of state money — being directed their way.